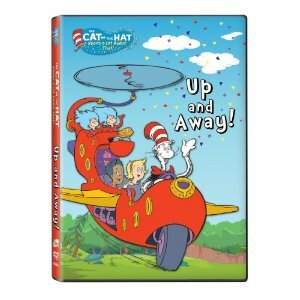 A little over a month ago I was lucky enough to win a giveaway that included this dvd: Cat in the Hat: Up and Away! and I was curious because while we have read some of the Cat in the Hat books I’ve never seen the cartoon. My 4 year old curious as ever found the dvd and immediately wanted to open it and watch it. It was all over from there. She wanted to watch it every day and while it’s actually kind of interesting even for me and has a few funny parts after watching it for the umpteenth time I was getting a little sick of it. Luckily PBS kids has it on tv so I’ve managed to record some episodes to add variety to the rotation. Her favorite episode so far is when Nick and Sally go to meet Humphrey the whale to get singing lessons. There’s one line with the kids screeching “caakke!” and the Cat in the Hat shows up yowling “caat!” that she cracks up over no matter how many times she watches it. When her grandmother arrived for a visit my daughter insisted grandma just had to watch this part because “it’s so funny!” as she puts it. I have become quite a fan of Cat in the Hat videos as well as they are funny yet informative. My daughter does bring up random facts she remembers from watching these episodes and she will ask me questions about things she sees in the video. My almost 2 year old will watch it as well but he still prefers Max and Ruby so it has proved to be a challenge in limiting tv time yet being fair as to letting them both see their show. If your child is a fan of Cat in the Hat or even if they are new to it I would highly suggest the series and in particular this DVD.